It's not a secret how I feel when I stand next to you"
In August of 1987, Madonna crashed and burned onscreen in a little gem called "Who's That Girl". The film originally was supposed to be titled Slammer and I can remember there was a lot of build up all summer long because well, it was Madonna. Casting her wasn't enough to save the movie but the soundtrack? Well, that handed us a few classic dance songs that still sound pretty great. "Who's That Girl" was the first single, dropped in advance of the movie and went to number one on Billboard's Hot 100. It was followed by one of my very favorite Madonna dance floor classics, "Causing a Commotion". I remember the song just kind of appearing out of nowhere and it was super catchy. Every soundtrack is ultimately bought because of that one song that makes you have to have it and this was that song. It topped the dance charts and went to number two on Billboard's Hot 100. 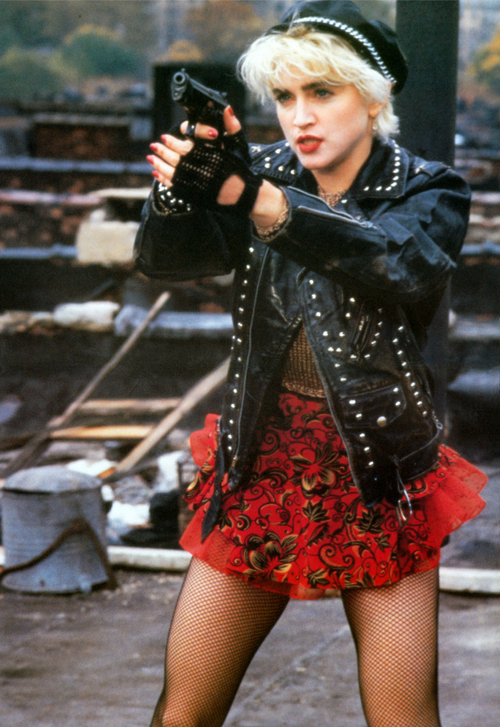 The song itself was written towards the end of Madonna's marriage to Sean Penn, a union plagued by his violent outbursts and clashes with the paparazzi. Based on what MTV and magazine articles said (no internet yet, remember?) their relationship seemed chaotic and complicated, kind of like this song. Check it out!